I’ve had every intention of posting a work week outfit round up and have not had the time! Hopefully once work settles down a little bit, I can get in to a more regular posting schedule. And next week we have new J.Crew arrivals which will hopefully mean some try-ons! It’s no secret that I am a bit stripesick…I have my fair share of striped t-shirts and turtlenecks, and sweaters…I can’t seem to get enough. 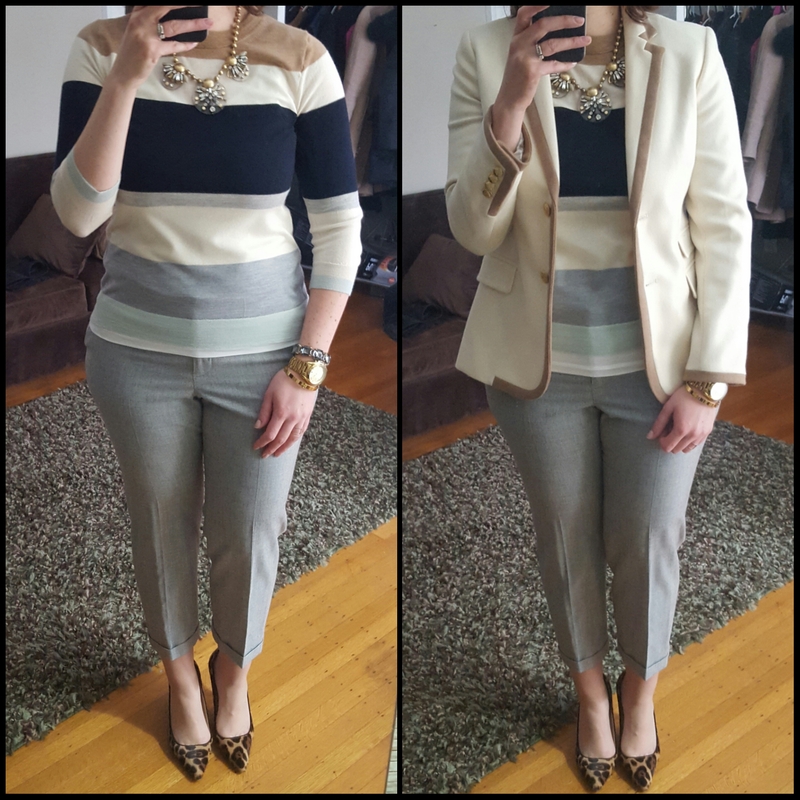 Here’s a few of my outfits from last week – two work outfits and a weekend outfit! First up…a work day outfit. And my Friday work outfit. 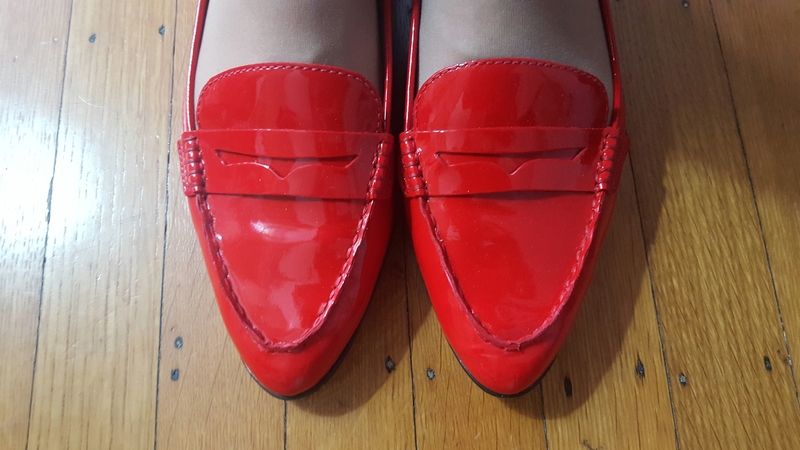 I purchased the J.Crew Collins Patent Loafers in Bright Cerise last week and was thrilled to find they were more of a lipstick red than an orangey-red as the name would suggest. I paired them with stripes and a chunky grey cardigan both for work and going out for dinner/drinks with family on the weekend. Saturday rolled around and I had to wear the loafers again! 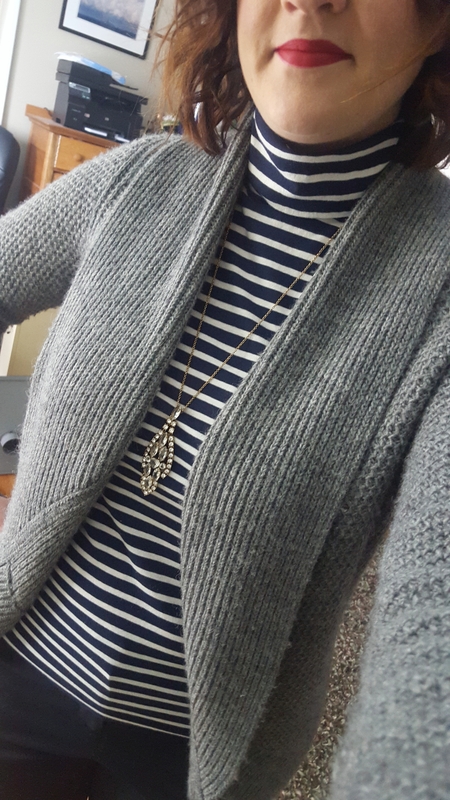 So I did a not too creative switch up for with jeans, a different striped shirt (I started with a tee and ended up with another turtleneck) and a different grey cardigan (yeah, it’s probably not necessary that I have two similar grey sweaters but I liked the longer length of this J.Crew one for wearing with my Pixie pants. And a close up of the shoes…because they’re gorgeous! Not a very verbose post but it’s a peek in to a few outfits from the last few days! I’ll get up and running on the work wardrobe roundup soon. So, how about you? Are you stripesick or can you resist all things striped? Would love to hear what you think and thanks for visiting!